It was in the new state of Nebraska over 135 years ago that J. Sterling Morton led the initiative to set aside a special day for planting trees, saying, �Each generation takes the earth as trustees.�* Today his idea is still honored with various corporate and individual efforts across the nation. 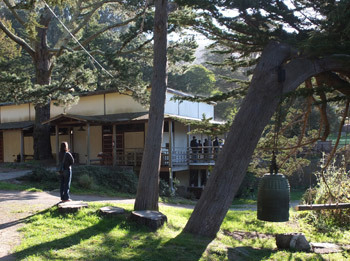 Locally, the Zen practice nurtured at Green Gulch Farm for the last 42 years seems to fall directly in line with Morton�s statement. 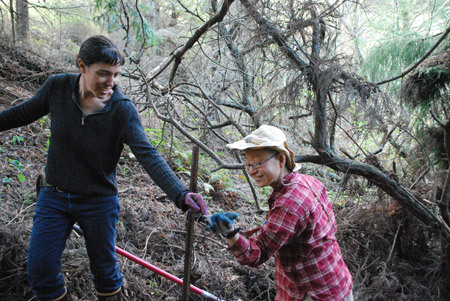 Here, volunteer work parties convene one afternoon each month to care for the surrounding land and trees. A special Arbor Day focus coincides with the next Work Party Day, on Sunday, February 23, from 2 to 5 pm. I asked Work Party Leader and Land Advocate Sukey Parmelee to explain how we honor the tree in our neck of the woods. Why do we have an �Arbor Day� at Green Gulch Farm, and how is it different from the regular monthly Watershed Work Party Days at Green Gulch? Arbor Day at Green Gulch was inspired by British economist E. F. Schumacher, author of Small Is Beautiful: A Study of Economics As If People Mattered, when he visited Green Gulch in 1976. He spoke of his experience with Ghandi, of the forest farms, and of the monks in India who were responsible for maintaining and planting trees. Myogen Steve St�cky and others decided to institute Arbor Day as a tree awareness day�first on the national date in April, and later we moved it to February, a time more suitable to our semi-arid climate. The strong committment of Wendy Johnson to this day dedicated to trees ensures that this annual event is always on our calendar. In more recent years this special day has come to include a larger awareness of caring for the watershed as well as caring for and honoring the trees. Although the activities can be similar to Watershed Work Party Days, Arbor Day features more of a ceremony and is inclusive of a wider gathering of people. If you still plant trees on this day, where do you plant them? What types of trees are planted, or does that matter? In the past, Douglas Fir, Monterey Pine, Redwood, Black Cottonwood, and Yellow Basket Willow trees were planted. 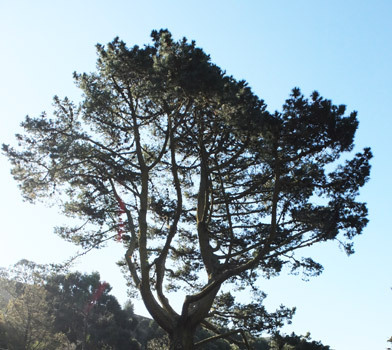 Currently, we plant a few Redwoods and Coast Live Oaks, as well as a variety of native shrubs and grasses�emphasizing different areas of Green Gulch in different years. There are some wood-burning stoves at Green Gulch. Where does that wood come from? When trees need to be removed or sometimes fall, the small wood is turned into wood chips, and the larger wood sawed into rounds, which are later split for firewood. How has the current drought affected the watershed and, perhaps, watershed activities at Green Gulch? This year we will acknowledge the lack of water by planting in a limited area that can be watered with drip irrigation. Our activities will include seed sowing of trees in flats, caring for the many trees that have been planted in the past, removing weeds that compete for water, and thoroughly watering some of our last year’s plantings. Everyone is welcome and invited to join in Arbor Day and/or watershed activities. For more information, visit the Watershed pages on our website. To sign up or to be included in email work-party announcements, please send a request to sukey.parmelee@sfzc.org�or just come. *A resource for this article was arborday.org.